Founded in 1998, HMS Associates is a premier real estate firm that provides appraisals residential and commercial.Clients range from financial institutions to law firms to individual home and business owners who need to know the value of their property value throughout the New York and Tri-State Area. With the Ecommerce website designed by Bitochon, customers can request an appraisal online. By using the online order form and a credit card. 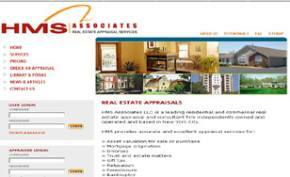 The site also provides all types of useful information about appraisals. The website is fully maintained by the business owner via our easy to use interface.